Background: The aim of this study was to investigate the correlation of EGFR mutation on the high-resolution computed tomography (HRCT) features in lung adenocarcinoma. Patients and methods: A total of 121 patients were diagnosed with lung adenocarcinoma from January 2014 to December 2016. The correlation of indexes (gender, age, tumor diameter, and EGFR mutation) was analyzed based on the HRCT characteristics of lung adenocarcinoma. Results: There were 73 cases of EGFR mutation and 48 cases of wild-type EGFR. One hundred and three cases had pleural indentation that was significant in patients with EGFR mutation than those with wild-type EGFR (P=0.038). Forty-two out of 121 cases exhibited the bronchus cutoff sign. Patients with EGFR mutation were likely to develop the bronchus cutoff sign (P=0.017). Sixty-one out of 121 cases exhibited the lobulation sign, which was significant in patients with EGFR mutation than those with wild-type EGFR (P<0.001). A significant correlation was found between lobulation sign and tumor diameter (P=0.024). Forty-eight out of 121 and 23 out of 121 cases showed the vessel and vacuole signs, respectively. However, patients with EGFR mutation did not exert a significant correlation on either of these signs (P=0.555 and P=0.372, respectively). A statistical significance was not observed in indexes such as age, gender, and tumor diameter on pleural indentation, bronchus cutoff sign, vessel sign, and vacuole sign (P>0.05). Age and gender did not vary significantly in the lobulation sign (P>0.05). Conclusion: HRCT characteristics such as pleural indentation, bronchus cutoff sign, and lobulation sign in lung adenocarcinoma with EGFR mutation were significantly greater than those with wild-type EGFR; however, further study is essential in determining the predictive ability of computed tomography (CT) for EGFR mutations in lung adenocarcinoma. The incidence of lung cancer is continually increasing; currently, it is 54.8/100,000 with a 26.9% rate of increase in China from 1972 to 2006. However, the effect of treatment on the disease is not improved substantially, and the overall survival rate is 10%–15%.1 High-resolution computed tomography (HRCT) is primarily used for the early detection of lung adenocarcinoma. 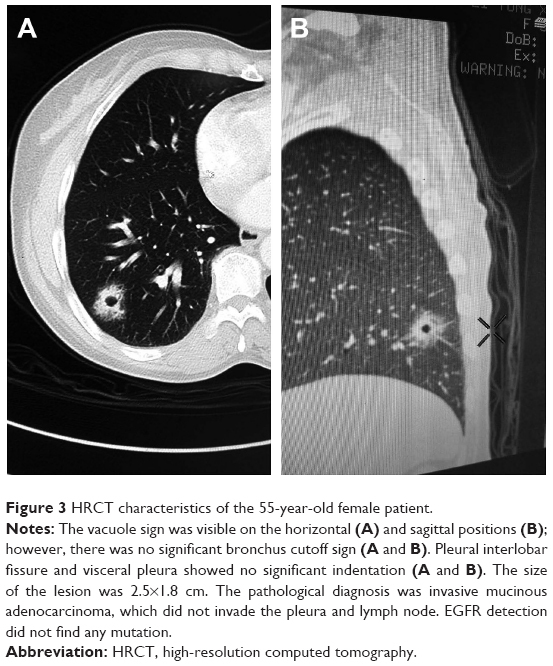 Due to the prolonged doubling time of the lesion and since the altered diameter and volume of the lesion cannot be observed in a short period, the assessment of invasiveness mainly relies on the characteristics of HRCT.2 The common computed tomography (CT) signs include pleural traction, lobulation sign, vessel sign, vacuole sign, and bronchus cutoff sign. Early peripheral adenocarcinoma is mainly treated by surgery. When the lesion diameter is small, the pathological diagnosis before an operation, using bronchoscopy or percutaneous pulmonary biopsy, is challenging. In this case, the HRCT characteristics are crucial reference indicators that can impact the early diagnosis, treatment, and prognosis of lung adenocarcinoma.3,4 The rate of EGFR mutation is up to 60% in lung adenocarcinoma in the Asian population, and patients with the mutation exhibit significant invasiveness and poor prognosis.5 Previous studies have shown that patients with EGFR mutation are susceptible to recurrence and distant metastasis after operation.6 Chao et al7 found that the EGFR mutation in Chinese patients was correlated with the recent pathological classification and prognosis of lung adenocarcinoma. The present study aimed to employ a 64-slice CT examination to find lesions, followed by a 0.625 mm reconstruction for evaluating the relationship between the invasiveness of lung adenocarcinoma on the peripheral structures and EGFR mutation. This correlation would elucidate the effect of EGFR mutation on early HRCT imaging characteristics, thereby guiding the clinical treatment. This study was approved by the medical ethical committee of Linyi City People’s Hospital as a retrospective study. The requirement for patient informed consent was waived by the ethical committee because of the retrospective nature of this study, but patient data confidentiality was protected. The ID of ethical approval was 30009 with confirmation of compliance with the Declaration of Helsinki. A total of 121 patients diagnosed with lung adenocarcinoma in Linyi People’s Hospital from January 2014 to December 2016 were analyzed retrospectively. All patients had undergone a 64-slice enhanced CT scanning. The HRCT characteristics, including pleural indentation, bronchus cutoff sign, vessel sign, vacuole sign, and lobulation sign, were observed. Moreover, statistical analysis was performed to analyze the effect of EGFR mutation, gender, age, and tumor diameter (largest diameter on axial, sagittal, and coronal sections) on the imaging characteristics. All patients were diagnosed by bronchoscopy biopsy, percutaneous pulmonary biopsy, or postoperative pathology, and the EGFR mutation was detected. All patients were diagnosed with lung adenocarcinoma stage I–IIIA for the first time and did not undergo radiotherapy, chemotherapy, or targeted therapy. The absence of metastasis was confirmed by positron emission tomography-CT or cerebral magnetic resonance imaging, bone emission computed tomography, and abdominal ultrasound. All patients underwent 64-slice unenhanced and post-contrast CT scanning (Light Speed VCT 64; GE Healthcare Bio-Sciences Corp., Piscataway, NJ, USA) with layer thickness and interval of 0.625 mm. The CT scanning ranged from the superior aperture of the thorax to the costophrenic angle. First, the unenhanced scanning was performed, followed by the bolus injection of contrast agent using a high-pressure syringe (iopromide 300, 300 mgI/mL; flow rate, 3 mL/s; total amount, 80 mL; cubital vein injection). The post-contrast scanning was conducted at the delayed stage (30 seconds after venous stage). Three-dimensional reconstruction was performed if necessary, wherein the horizontal plane was considered as the routine layer. Thin-section CT was performed to evaluate the entire lung with a collimation of 0.625 mm. The lung was imaged with a window of −500 to −700 Hounsfield units (HU) and width of 1,500–2,000 HU as the lung window. Two radiologists (10 years of experience in chest imaging, respectively), who were blinded to the histological result of the lesion, assessed the HRCT images on both mediastinal (width, 350 HU; level, 40 HU) and lung (width, 1,450 HU; level, −520 HU) windows. The findings were inferred by a consensus. The HRCT findings of each nodule were analyzed as follows: 1) shape (round or oval, lobulated, or irregular); 2) margin (spiculated or smooth); 3) diameter (the largest diameter on axial, sagittal, and coronal sections); 4) bronchus cutoff sign (the responsible bronchus clearly reached the inside of the target lesion); 5) vascular changes (dilated, rigid, convergent, and tortuous). The vessel from the nodule to the hilum was traced to determine its source, which might be pulmonary or bronchial and artery or vein; 6) pleural indentation (indentation of the pleura toward the tumor), including visceral pleura, interlobar fissure pleura, and mediastinal pleura; 7) vacuole, the presence of air in the tumor at the time of diagnosis prior to biopsy or treatment. Figure 1 A 0.625 mm thin layer was reconstructed to observe the lesion in the sagittal, coronal, and horizontal positions on a lung window image. Notes: (A) Sagittal position: interlobar fissures and pleural indentation. (B) Coronal position: bronchus cutoff sign. (C) Horizontal position: vessel sign. Pathological sections were used to assess the mutation on exons 18, 19, 20, and 21 by scorpion amplification-refractory mutation system-polymerase chain reaction (ARMS-PCR). The gene mutation detection kit was purchased from Amoy Diagnostics Co., Ltd. (Xiamen, China). Statistical analysis was performed using the SPSS19.0 software package (IBM Corporation, Armonk, NY, USA). Continuous data were analyzed by unpaired t-test and categorical data by chi-squared test (P<0.05). Multivariate analyses were performed by a logistic regression analysis. ORs and 95% CI were calculated. In all the tests, two-sided P-values of <0.05 were considered statistically significant. A cohort of 121 patients with peripheral lung adenocarcinoma included 41 males and 80 females. All patients exhibited a single lesion in the lungs. A total of 23 cases were diagnosed using BF260 electronic bronchoscopy biopsy (Olympus Corporation, Tokyo, Japan), 27 cases by percutaneous pulmonary biopsy, and 71 cases by postoperative specimens. All specimens were wrapped in paraffin, followed by conventional pathological examination and evaluation of the EGFR mutation. Seventy-three out of 121 cases harbored the EGFR mutation (60.33%), whereas 48 were wild-type EGFR (39.67%). The HRCT characteristics were as follows: 103/121 cases exhibited pleural indentation (85.12%), 42/121 cases showed the bronchus cutoff sign (34.71%), 61/121 cases presented the lobulation sign (50.41%), 48/121 cases showed the vessel sign (39.67%), and 23 cases exhibited the vacuole sign (19.01%). The correlation of indexes such as EGFR mutation, gender, age, and tumor diameter with the characteristics of HRCT was analyzed statistically. A total of 103 cases exhibited pleural indentation, which included 66 patients with and 37 patients without EGFR mutation, 90.41% sensitivity and 22.92% specificity. Pleural indentation was found to be excessive in patients with EGFR mutation than those with wild-type EGFR (OR =3.193 [95% CI 1.067–9.558], P=0.038). Moreover, 42 cases, including 31 cases of mutation and 11 cases of wild-type EGFR, exhibited the bronchus cutoff sign. Moreover, the bronchus cutoff sign was significantly greater in patients with EGFR mutation than those with wild-type EGFR (OR =2.836 [95% CI 1.20–6.692], P=0.017), 42.47% sensitivity and 77.08% specificity. A total of 61 cases, including 45 patients with mutation and 16 patients with wild-type EGFR, presented the lobulation sign. The lobulation sign was observed to a greater extent in patients with EGFR mutation as compared to those with wild-type EGFR (OR =4.638 [95% CI 1.963–10.960], P=0.000), 61.64% sensitivity and 66.67% specificity. A significant correlation was found between lobulation sign and tumor diameter (OR =1.036 [95% CI 1.005–1.068], P=0.024). A total of 48 cases, including 30 patients with mutation and 18 patients with wild-type EGFR, demonstrated the vessel sign. The EGFR mutation did not exhibit any effect on the vessel sign (OR =1.266 [95% CI 0.578–2.773], P=0.555). Furthermore, 23 patients, including 16 patients with EGFR mutation and 7 patients with wild-type EGFR, presented the vacuole sign. However, the EGFR mutation did not exhibit a significant effect on the vacuole sign (OR =1.584 [95% CI 0.557–4.352], P=0.372). Parameters such as age, gender, and tumor diameter did not vary significantly with respect to pleural indentation, bronchus cutoff sign, vessel sign, and vacuole sign (P>0.05); however, age and gender did not vary significantly on the lobulation sign (P>0.05; Tables 1–6). A 0.625 mm reconstruction of HRCT characteristics is shown in Figures 2 and 3. Figure 2 HRCT characteristics of the 60-year-old male patient. Notes: (A) Sagittal position showed an interlobar fissure and visceral pleural indentation. (B and C) CT vessel sign, bronchus cutoff sign, and vacuole sign in the horizontal level. The size was 2.7×2.5 cm, and the pathological results showed a moderately differentiated adenocarcinoma, which did not invade the pleura and lymphatic vessels. The evaluation of EGFR revealed the mutation on exon 19. Abbreviations: CT, computed tomography; HRCT, high-resolution computed tomography. Figure 3 HRCT characteristics of the 55-year-old female patient. 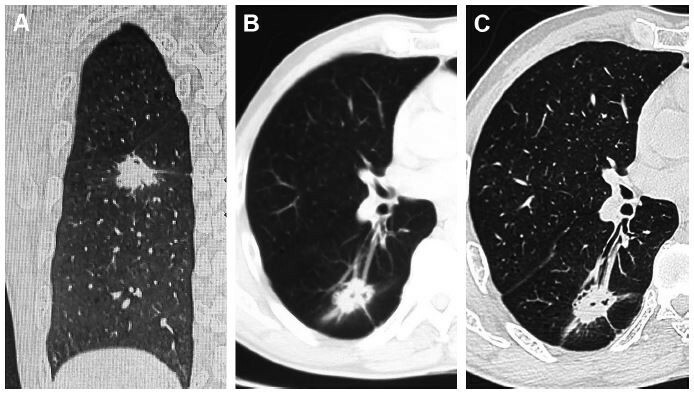 Notes: The vacuole sign was visible on the horizontal (A) and sagittal positions (B); however, there was no significant bronchus cutoff sign (A and B). Pleural interlobar fissure and visceral pleura showed no significant indentation (A and B). The size of the lesion was 2.5×1.8 cm. The pathological diagnosis was invasive mucinous adenocarcinoma, which did not invade the pleura and lymph node. EGFR detection did not find any mutation. Abbreviation: HRCT, high-resolution computed tomography. The early invasiveness of lung adenocarcinoma primarily includes the invasion of the peripheral structures, such as intra-alveolar invasion, interlobular septal invasion, pleural invasion, and local bronchial lumen invasion.16,17 Common HRCT signs include pleural indentation, vacuole sign, lobulation sign, vessel sign, bronchial stiffness, traction, narrowing, and truncation.18 The present study used a 0.625 mm thin-layer CT and reconstructions at sagittal, coronal, and horizontal positions. Thus, the characteristics of CT images, especially the visceral pleural indentation, interlobar fissure pleural indentation, and mediastinal pleural indentation, were observed from multiple views along with the bronchus cutoff sign. The thin-layer CT illustrates the vessel sign, vacuole sign, and lobulation sign rather adequately.12 The present study found that age, gender, and tumor diameter did not vary significantly on pleural indentation, bronchus cutoff sign, vessel sign, and vacuole sign (P>0.05). Age and gender did not vary significantly on the lobulation sign (P>0.05); however, the lobulation signs are prone to appear in tumors of larger diameters (OR =1.036 [95% CI 1.005–1.068], P=0.024). Intriguingly, the EGFR mutation was significantly correlated with the characteristics of some HRCT images. The invasion of tumor on the peripheral structures led to pleural indentation or direct invasion.19,20 Pleural invasion affected the prognosis of the patients,21,22 and the HRCT-based reconstruction demonstrated 103 cases with visceral pleura, interlobular pleura, and mediastinal pleural indentation. The pleural indentation signs were found to be more in patients with EGFR mutation (OR =3.193 [95% CI 1.067–9.558], P=0.038); Smits et al23 reported that the patients with EGFR mutation were prone to pleural metastasis; Rizzo et al24 found an association between EGFR mutation and pleural retraction. Bronchus cutoff sign suggested that the cancer cells invaded along the alveolar structure and peripheral bronchiole. The tumor tissue was exposed to the bronchial cavity resulting in the bronchus cutoff at the edge of the tumor.17 Hsu et al25 reported that air bronchograms were more common in the tumors with EGFR mutation, and the participation of bronchial wall and HRCT reconstruction identified the bronchial imaging features including the expansive and tractive bronchioles around the tumor. Our study suggests that bronchus cutoff sign is correlated with EGFR mutation (OR =2.836 [95% CI 1.20–6.692], P=0.017). Moreover, patients with EGFR mutation were susceptible to the lobulation sign as compared to those with wild-type EGFR (OR =4.638 [95% CI 1.963–10.960], P=0.000), common lobulation sign is primarily moderate or deep, and the tumor with the lobulation sign indicated significant growth and irregular shape, thereby leading to a poor prognosis,26 Hasegawa et al27 reported that EGFR-mutated adenocarcinoma showed significantly higher frequencies of the lobulation sign at HRCT compared to the non-EGFR-mutated type. The CT vessel sign indicated the potential increase in cancerogenesis of the lung nodules significantly.28 Henschke et al4 reported that the lesion hyperplasia with vessel sign was accelerated, which was also a piece of evidence identifying the benign and malignant nodules. This study revealed that the CT vessel sign was not significantly correlated with the EGFR mutation. Furthermore, the vacuole sign indicated that the alveolar structure was not distorted, and the alveolar inflation or some necrosis tissues were discharged. This phenomenon was observed frequently in adherent growth or acinar adenocarcinoma, suggesting early invasion.29,30 This study concluded that there is no significant correlation between vacuolar sign and EGFR gene mutation (OR =1.584 [95% CI 0.557–4.352], P=0.372), and Zaibo et al31 reported similar findings. Disadvantages of the present study are as follows: our study mainly ascertained the HRCT imaging characteristics of lung adenocarcinoma and evaluated the mutant state of EGFR. However, we did not collect all the CT characteristics of non-small-cell lung cancer as well as other related genes. Therefore, further studies using large sample size and multicenter data are essential. In addition, this study was a retrospective analysis that might lead to selection bias. Patients with lung adenocarcinoma underwent 0.625 mm thin-layer CT and reconstruction and displayed HRCT signs. Statistical analysis obtained the imaging characteristics of patients with EGFR mutation: pleural indentation, lobulation sign, and bronchial truncation sign that were significantly greater than those with wild-type EGFR. These phenomena can provide the reference for clinical treatment. The pleural indentation sign, lobulation sign, and bronchus cutoff sign occurring alone or coexisting with multiple CT signs suggested a putative EGFR mutation. In this case, the invasiveness was enhanced that necessitated appropriate clinical treatment at the earliest. Thus, further studies are essential to predict the EGFR mutations in lung adenocarcinoma using CT. This study was supported by the Project of Medical and Health Science Technology in Shandong Province (2015WS0376). Yanagawa M, Tanaka Y, Kusumoto M, et al. Automated assessment of malignant degree of small peripheral adenocarcinomas using volumetric CT data: correlation with pathologic prognostic factors. Lung Cancer. 2010;70(3):286–294. Zhang J, Wu J, Tan Q, Zhu L, Gao W. Why do pathological stage IA lung adenocarcinomas vary from prognosis? : a clinicopathologic study of 176 patients with pathological stage IA lung adenocarcinoma based on the IASLC/ATS/ERS classification. J Thorac Oncol. 2013;8(9):1196–1202. Henschke CI, Boffetta P, Gorlova O, Yip R, Delancey JO, Foy M. Assessment of lung-cancer mortality reduction from CT Screening. Lung Cancer. 2011;71(3):328–332. Koh Y, Jang B, Jeon YK, et al. EGFR gene copy number gain is related to high tumor SUV and frequent relapse after adjuvant chemotherapy in resected lung adenocarcinoma. Jpn J Clin Oncol. 2011;41(4):548–554. Ahn HK, Choi YL, Han JH, et al. Epidermal growth factor receptor mutation and treatment outcome of mediastinoscopic N2 positive non-small cell lung cancer patients treated with neoadjuvant chemoradiotherapy followed by surgery. Lung Cancer. 2013;79(3):300–306. Chao L, Yi-Sheng H, Yu C, et al. Relevance of EGFR mutation with micropapillary pattern according to the novel IASLC/ATS/ERS lung adenocarcinoma classification and correlation with prognosis in Chinese patients. Lung Cancer. 2014;86(2):164–169. Saruwatari K, Ikemura S, Sekihara K, et al. Aggressive tumor microenvironment of solid predominant lung adenocarcinoma subtype harboring with epidermal growth factor receptor mutations. Lung Cancer. 2016;91:7–14. Zhang Y, Li J, Wang R, et al. The prognostic and predictive value of solid subtype in invasive lung adenocarcinoma. Sci Rep. 2014;4:7163. Liu Y, Kim J, Qu F, et al. CT features associated with epidermal growth factor receptor mutation status in patients with lung adenocarcinoma. Radiology. 2016;280(1):271–280. Borczuk AC. Assessment of invasion in lung adenocarcinoma classification, including adenocarcinoma in situ and minimally invasive adenocarcinoma. Mod Pathol. 2012;25(Suppl 1):S1–S10. Honda T, Kondo T, Murakami S, et al. Radiographic and pathological analysis of small lung adenocarcinoma using the new IASLC classification. Clin Radiol. 2013;68(1):e21–e26. Hsu KH, Chen KC, Yang TY, et al. Epidermal growth factor receptor mutation status in stage I lung adenocarcinoma with different image patterns. J Thorac Oncol. 2011;6(6):1066–1072. Usuda K, Sagawa M, Motono N, et al. Relationships between EGFR mutation status of lung cancer and preoperative factors – are they predictive? Asian Pac J Cancer Prev. 2014;15(2):657–662. Cohen JG, Reymond E, Lederlin M, et al. Differentiating pre- and minimally invasive from invasive adenocarcinoma using CT-features in persistent pulmonary part-solid nodules in Caucasian patients. Eur J Radiol. 2015;84(4):738–744. Zhang Y, Qiang JW, Ye JD, Ye XD, Zhang J. High resolution CT in differentiating minimally invasive component in early lung adenocarcinoma. Lung Cancer. 2014;84(3):236–241. Qiang JW, Zhou KR, Lu G, et al. 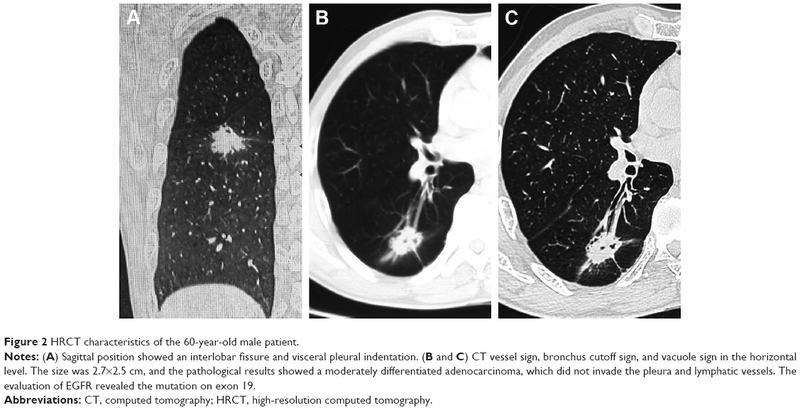 The relationship between solitary pulmonary nodules and bronchi: multi-slice CT-pathological correlation. Clin Radiol. 2004;59(12):1121–1127. Jiang B, Takashima S, Miyake C, et al. Thin-section CT findings in peripheral lung cancer of 3 cm or smaller: are there any characteristic features for predicting tumor histology or do they depend only on tumor size? Acta Radiol. 2014;55(3):302–308. Ebara K, Takashima S, Jiang B, et al. Pleural invasion by peripheral lung cancer: prediction with three-dimensional CT. Acad Radiol. 2015;22(3):310–319. Qi LP, Li XT, Yang Y, et al. Multivariate analysis of pleural invasion of peripheral non-small cell lung cancer-based computed tomography features. J Comput Assist Tomogr. 2016;40(5):757–762. Shimizu K, Yoshida J, Nagai K, et al. Visceral pleural invasion is an invasive and aggressive indicator of non-small cell lung cancer. J Thorac Cardiovasc Surg. 2005;130(1):160–165. Oyama M, Miyagi Maeshima A, Tochigi N, et al. Prognostic impact of pleural invasion in 1488 patients with surgically resected non-small cell lung carcinoma. Jpn J Clin Oncol. 2013;43(5):540–546. Smits AJ, Kummer JA, Hinrichs JW, et al. EGFR and KRAS mutations in lung carcinomas in the Dutch population: increased EGFR mutation frequency in malignant pleural effusion of lung adenocarcinoma. Cell Oncol. 2012;35(3):189–196. Rizzo S, Petrella F, Buscarino V, et al. CT radiogenomic characterization of EGFR, K-RAS, and ALK mutations in non-small cell lung cancer. Eur Radiol. 2016;26(1):32–42. Hsu JS, Huang MS, Chen CY, et al. Correlation between EGFR mutation status and computed tomography features in patients with advanced pulmonary adenocarcinoma. J Thorac Imaging. 2014;29(6):357–363. Ikehara M, Saito H, Kondo T, et al. Comparison of thin-section CT and pathological findings in small solid-density type pulmonary adenocarcinoma: prognostic factors from CT findings. Eur J Radiol. 2012;81(1):189–194. Hasegawa M, Sakai F, Ishikawa R, Kimura F, Ishida H, Kobayashi K. CT features of epidermal growth factor receptor-mutated adenocarcinoma of the lung: comparison with nonmutated adenocarcinoma. J Thorac Oncol. 2016;11(6):819–826. Xing Y, Li Z, Jiang S, Xiang W, Sun X. Analysis of pre-invasive lung adenocarcinoma lesions on thin-section computerized tomography. Clin Respir J. 2015;9(3):289–296. Nakazono T, Sakao Y, Yamaguchi K, Imai S, Kumazoe H, Kudo S. Subtypes of peripheral adenocarcinoma of the lung: differentiation by thin-section CT. Eur Radiol. 2005;15(8):1563–1568. Ding H, Shi J, Zhou X, et al. Value of CT characteristics in predicting invasiveness of adenocarcinoma presented as pulmonary ground-glass nodules. Thorac Cardiovasc Surg. 2017;65(2):136–141. Zaibo L, Dacic S, Pantanowitz L. Correlation of cytomorphology and molecular findings in EGFR+KRAS, + and ALK+ lung adenocarcinomas. Am J ClinPathol. 2014;141:420–428. Zaric B, Stojsic V, Kovacevic T, et al. Clinical characteristics, tumor, node, metastasis status, and mutation rate in domain of epidermal growth factor receptor gene in Serbian patients with lung adenocarcinoma. J Thorac Oncol. 2014;9(9):1406–1410. Yendamuri S, Sharma R, Demmy M, et al. Temporal trends in outcomes following sublobar and lobar resections for small (≤ 2 cm) non-small cell lung cancers – a surveillance epidemiology end results database analysis. J Surg Res. 2013;183(1):27–32. Koike T, Koike T, Yoshiya K, Tsuchida M, Toyabe S. Risk factor analysis of locoregional recurrence after sublobar resection in patients with clinical stage IA non-small cell lung cancer. J Thorac Cardiovasc Surg. 2013;146(2):372–378. Cañizares MA, Matilla JM, Cueto A, et al. Atypical carcinoid tumours of the lung: prognostic factors and patterns of recurrence. Thorax. 2014;69(7):648–653.